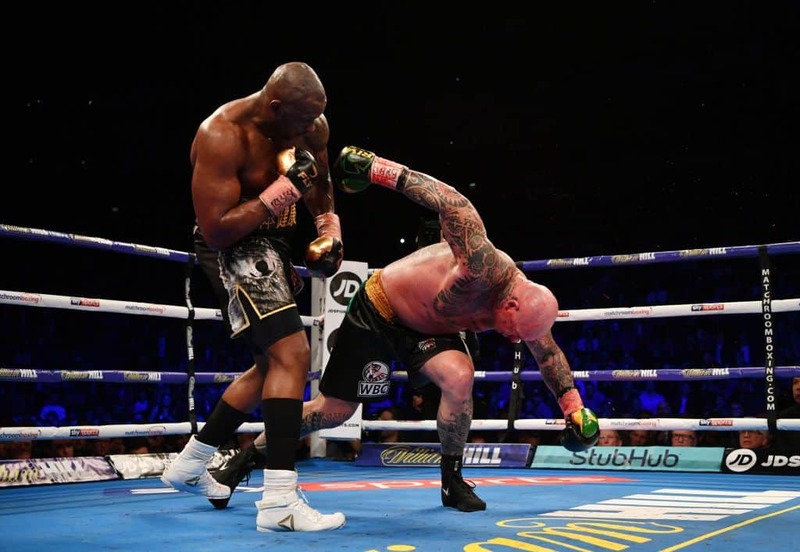 Dillian Whyte (23-1, 17 KOs) produced an emphatic display last night after dishing out a masterclass performance against Lucas Browne (25-1, 22 KOs) at the O2 Arena in London, Whyte unleashed a devastating left-hook to the side of Browne head, which saw him knocked out cold before he hit the canvas. Dillian Whyte has now blasted himself into prime position to challenge Deontay Wilder, the WBC heavyweight champion, or even face his previous foe in Anthony Joshua. Dillian Whyte came into the fight looking ripped, while his opponent looked as though he hadn’t even trained, appearing slow, sluggish and cumbersome. Dillian Whyte schooled the Australian, the Brixton man looked sharped from the start, he kept his discipline throughout the fight, taking Lucas Browne apart with a number of bruising jabs and over-hand rights. This lead to the Australian receiving a bad cut over his right eye, with blood dripping from the cut, Whyte sensed his opportunity to up the tempo. From the third round Browne got wobbled from some big right hands and he decided to trade, which ‘The Body Snatcher’ answered back with more accuracy, going down to the body and tagging the ribs in the fourth. By the fifth round, Browne’s face was a complete mess and could hardly see what was coming at him when Whyte landed a huge right hand. Dillian Whyte came flying out in the sixth round, unleashing a flurry of punches on Browne and that was when Whyte landed a sickening left-hook to side of Browne’s head which ended the fight. The boxing world for a moment held their breath as medics attended to Browne, who hit the canvas hard out cold, a short while later Browne was helped to his feet met with applauds from the crowd. This victory could now setup a potential mouth-watering match-up against WBC champion Deontay Wilder (40-0, 39 KOs), Dillian Whyte is No1 ranked contender for Wilder’s WBC title, but the governing body didn’t inform Whyte and Browne that their fight was a WBC heavyweight title eliminator, it will be up to the WBC at the end of the day whether to force Wilder to face his mandatory challenger next. Dillian Whyte destroys Lucas Browne in six rounds at the O2 Arena. There is talk of a super-fight with Deontay Wilder facing Anthony Joshua next should the Brit get pass Joshua Parker, It’s going to be up to the WBC whether Whyte gets that shot. Speaking after the fight, Dillian Whyte said: “Hopefully he’s OK, he showed up and tried,” he told Sky Sports. “I proved I’m world-class. My training paid off. I’m a good fighter but people haven’t seen it yet. “I need the challenge there. Lucas Browne thought his power was incredible. I might not have 22 knockouts but I can crack. “When people stand in front of me it’s a different story. I’m going to lay all of these guys out one by one. After the fight, Eddie Hearn mentioned that Joshua had “been on the phone” to him immediately after Whyte’s victory, urging a rematch later this year. Joshua, though, has to first focus on the challenge ahead of him as he faces Joseph Parker at Cardiff’s Principality Stadium on Saturday night. Joshua will be putting his IBF and WBA titles on the line, while Parker’s WBO strap is also up for grabs making it the first heavyweight title unification fight ever to be held in the UK.